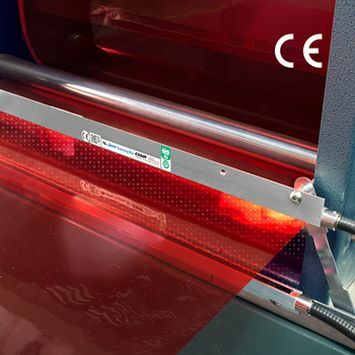 EXAIR's new Gen4 Ionizing Bar eliminates static electricity 25 percent better than previous models by eliminating larger static charges, faster. It has improved range and is effective when mounted up to 4" from a charged surface. Production speeds, product quality and surface cleanliness can improve dramatically. It eliminates static on plastics, webs, sheet stock and other product surfaces where tearing, jamming or hazardous shocks are a problem. Gen4 products have undergone independent laboratory tests to certify they meet the rigorous safety, health and environmental standards of the USA, European Union and Canada that are required to attain the CE and UL marks. They are also RoHS compliant. New design features include a metal armored high voltage cable to protect against abrasion and cuts, integrated ground connection and electromagnetic shielding. The Gen4 Ionizing Bar is compact which allows it to fit in the confined spaces of machinery, using an integrated mounting flange, where a static charge is generated. A high concentration of positive and negative ions produces fast static decay, neutralizing surfaces which are causing production, quality or safety problems. EXAIR's Gen4 Ionizing Bar product line is available from stock in 3" to 108" long. The electrical ion source is shockless and there is no radioactive element. A new selectable voltage power supply has been designed to operate Gen4 products. Applications include surface cleaning, neutralizing plastics, bag opening, printing machinery, packaging operations and elimination of painful static electricity shocks.